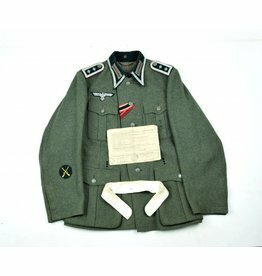 Superb original German M40 Field Blouse. 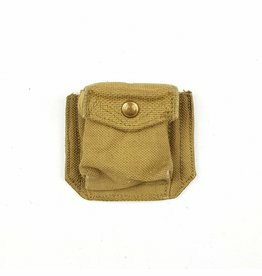 The inside of the jacket is partially lined with gray / brown cotton lining, with a bandage pocket at the bottom right. This is a reversible camouflaged parka in very good condition, NO repairs or damage! This unit labelled for illumination bombs with parachute. 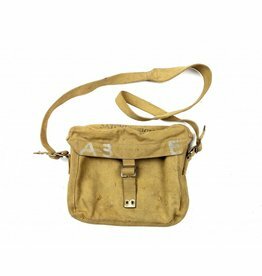 The carrying unit shows traces of storage, on one side the caps are rusty. Three tube carrying unit for 2 inch mortar bombs, bound together with steel strapping as made, including web carrying straps. 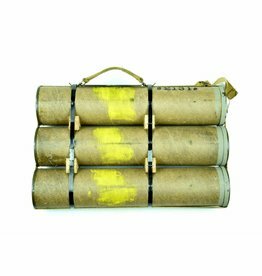 Three tube carrying unit for 3 inch mortar bombs, bound together with steel strapping as made, including web carrying straps. Nice message-form map with several message-form still present. The tunic bears printed/canvas shoulder titles, CANADA titles and division patches. 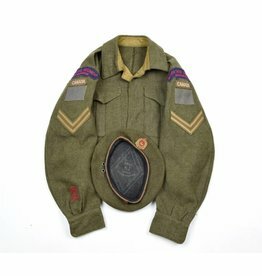 Embroidered Corporal chevrons and four years overseas stripes.